When you're ready, we go on the tour to see a great modern park, Madrid River Park. 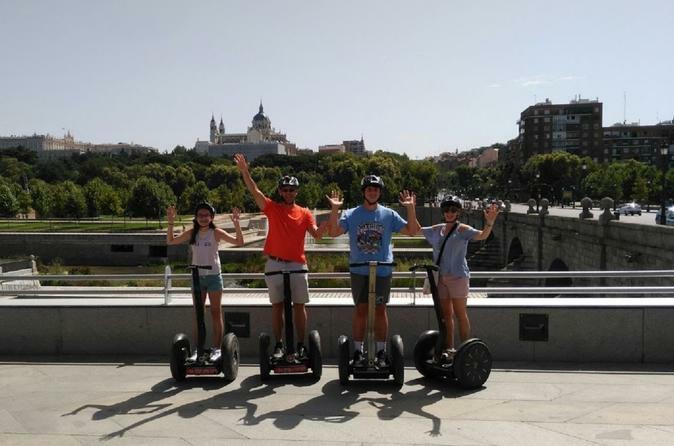 You will be able to see the Royal Palace, the old bridge of Segovia, the Door of Toledo, the modern Pasarela of Arganzuela, and the Cathedral of La Almudena in this singular tour. And also, enjoy a complete experience with a segway in this green area. If El Retiro is the most traditional park in the city, Madrid Río is the most modern green extension of Madrid. Built between 2006 and 2011, it runs through the Manzanares River basin and stands out for its balance between modernity and conservation of historic monuments. After a brief visit to the Royal Palace, we descend to the Manzanares River to reach La Puerta de San Vicente and the Puente del Rey, which provided the passage from the Royal Palace to the Casa de Campo. Another famous bridge that we will admire will be the Segovia one, a Renaissance work by Juan de Herrera, before reaching the Bridge of Andorra, and the Bridge of Toledo. One of the most beautiful of Madrid, the bridge is baroque style and it was Felipe IV who ordered its construction. From this, we move on to modernity, to the Pasarela de La Arganzuela, the most modern in Madrid, which will test our Segway handling. After a while of fun in this green area, we will go back to the Center through the Puerta de Toledo, stopping at the church of San Francisco el Grande, which has the third largest dome in Christendom. Finally we will visit the Plaza de Oriente and we will pass through the Cathedral of La Almudena. Emotions and fun times assured. Do not miss it.